British summer garden seasons are akin to orchestral oeuvres. The first movement starts gently and quietly in early spring, rapidly bursting into a cacophony of bright flowers and zingy foliage come May. What follows are waves of thousands of species of plants playing their pieces in countless symphonies then subsiding. August and early September is our chance to conduct the grand finale. There’s no time to lose, to tidy up and re-order, to revise spent garden planters, window boxes and borders to see the gardening year out in style, with a fresh sprinkling of ‘pizzazz’. Once gaps and opportunities are established, gather appropriate plants from your local garden centre, where late season bargains will await. August planting inspiration includes rich clusters of Aster, Rudbeckia, Dahlia, Penstemon, Agastache, Crocosmia, Fuchsia, Japanese Anemones, Phlox, Hydrangea and lots more. Grasses can also be planted up for more minimal and very stylish Autumn interest. Whenever adding new plants to the garden, whatever its size or shape, always consider plants that provide nectar, berries and seeds for native insects and birds, especially British bees and butterflies, which are currently declining in numbers. Sedum, Salvia, Helenium, Buddleia and Cosmos will all add cheer as well as vital nutrition for garden wildlife. For more bee and butterfly-friendly ideas, pop over to Pinterest and peruse our new bee & butterfly friendly gardens board. Courtyards, patios, border corners and path focal points can all be considered for a square planter and garden trough August refresh. Our range of lead-look troughs with in-built trellis can be cleverly placed to screen off seating areas (or inquisitive neighbours!). This will give hardy climbers a head start for next year. Seasonal window boxes too will benefit from some switching of containers and removable liners. 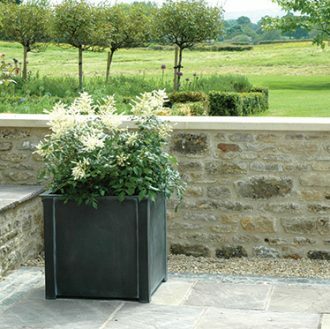 There’s always room for another container of colour or shapely evergreen structure. As ever, make sure they are very solid and frost hardy. August is also a good time to replant kitchen window boxes with fresh culinary herbs and to consider an indoor window box in a light area of the house. An interior kitchen window box can be sown with delicious salad leaves or tender herbs, to ‘cut and come again’ well into the Autumn. Try out a smaller independent for some unusual heritage vegetable seed varieties. Local to us in Somerset and available to order online, Pennard Plants is a great place to start. See more ideas for interior window boxes over on our House Planters & Wall Boxes Pinterest board. If you’re thinking of refreshing some garden hardware in time for your smartening up, late summer planting finale, do come and see us in our new Garden Requisites showroom, Batheaston near Bath. The beautiful City of Bath itself is always well worth a visit and, at this time of year, Bath in Bloom’s hanging baskets splash bright colour through the Georgian streets. 2017 also sees Bath’s world-famous Royal Crescent celebrate its 250th birthday and Jane Austen fans donning their frocks to flock to the city for the ten-day Jane Austen Festival, starting 8th September 2017. In the meantime, we would so love to see any of your Garden Requisites planting project successes. Please email pics to us at info@garden-requisites.co.uk to receive a voucher for 10% off your next order. Ooh, and with dryer spells due at the end of the month, don’t forget to arrange holiday watering cover so you can return to lush growth and a fresh flush of flowers and make time to sit amongst it all and enjoy the results!